Your Eyewitness was intrigued by the headline in the Chronic – “Ramjattan allays security fears of Chinese business community”. Now, he’d been reading almost every day of another “break and enter” of a Chinese business…and not only in Georgetown, but all over our fair land. He’d wondered if the Chinese were now seen by the burglary fraternity as the “easy marks” of Guyana. One Chinese business had been robbed four times in as many months! Not so long ago, when the “troubles” (as labelled by Granger) were in their full swing, the target of choice had been the Indian business community. They’d been robbed – and dozens kidnapped, killed, or given a sound gun-whipping for good measure. The official explanation offered then was that Indians weren’t being targeted…they were simply seen as “having the money”! It was the local variation of the answer by a bank robber who was asked why he robbed banks. “That’s where the money is!” he answered. So, are the Chinese businesses now seen as “where the money is”? It’s a fact that in quite a lot of locales across the country, they’ve replaced the Indian “mom-and-pop” groceries with new, large and highly visible supermarkets. They’re also open during all sorts of late hours to harvest as much cash as possible, and as such, it would appear there might be some validity to the claim by the Chinese business community that they’re being targeted. But yet, the headline blared: “Ramjattan allays security fears of Chinese business community”!! Now, the word “allay” means ‘to dispel”, and your Eyewitness wondered how the heck Ramjattan was able to effectuate this legerdemain of removing the fears of the Chinese business community!! Did he hand out machine guns to them? Did he tell them about his 2am curfew? Was he going to hook them up to his special Quick Response hookup, and deploy his SWAT team at the first buzz of the alarm? So, your Eyewitness delved into the article for answers. Seems Ramjattan had resorted to the tactic he’d introduced the moment he was made Public Security Minister – take cover under statistical and semantic contortions!! What he told the Chinese Ambassador was, “The crime statistics and the motives of those caught do not suggest any such profiling (of being targeted). Those (Chinese) who are victims are generally as a result of opportunistic criminals who prey on those who may not have been alert and (are) vulnerable”!!! And this “allayed” the fears of the Chinese businesses? All their fears disappeared as soon as they were told by Ramjattan they’re burgled at random, and not “targeted”?? So what to make of the Police Statistics claiming that “break and enter” had DECREASED by 5 percent??!! Your Eyewitness had warned about getting complacent after the GTU forced the Govt to accept binding arbitration, didn’t he? It’s not that he’s clairvoyant; it’s just that he’s been around the PNC for a bit. And you can’t teach old dogs new tricks. Once it became clear the “fix” wasn’t in on giving salary increases in exchange for votes in 2020, he knew the PNC was going to play hardball. So, imagine, after the GTU had objected to the Government appointing Keith Scott as “Conciliator” — since he collects a paycheck from the said Government every month — the Government goes and nominates two other employees for the Arbitration Panel chair — Dereck Cummings, PS at the Public Telecommunications Ministry; and Glendon Harris, Human Resources Manager at the GRA!!! So, their mouths (and consciences) aren’t muzzled like Scott’s?? 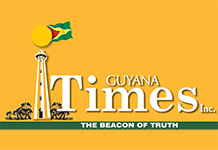 The GTU, on the other hand, proposed Former Minister of Foreign Affairs, Rashleigh Jackson; Former Government Minister Jeffrey Thomas; and Aubrey Armstrong, the 1999 arbitrator on the GPSU’s salary demands. Imagine, these PNC-friends are unacceptable!! So we’re now told the Cabinet will now be considering the amended Parking Meter Contract. Which part of the contract being “void ab initio” don’t they get? Can’t Basil Williams explain even this?